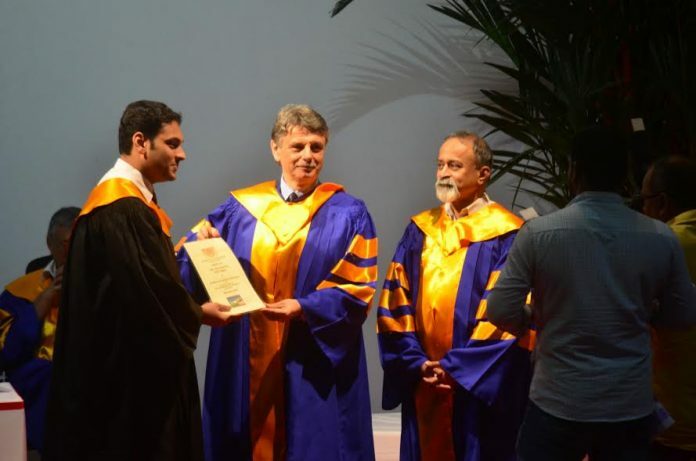 Sanquelim: Goa Institute of Management (GIM) one of the premier B-Schools in India, hosted its annual Convocation Ceremony for the PGDM batch of 2015 -17 at its sprawling campus in Sanquelim, Goa. Students turned professional managers received the coveted diploma after having completed over 22 months of academically packed, rigorous training with exposure to live industrial projects as well as community oriented assignments. A total of 271 students were awarded their diplomas at the convocation ceremony. While 216 are full-time PGDM students, 30 are from the part-time MBA program and 25 students are from the Post Graduate Diploma in Healthcare Management program (PGDM – HCM). The event ceremony was presided over by Prof. Dr. Ralf Speth, CEO, Jaguar Land Rover PLC, UK who delivered the convocation address. Dr. K Balakrishnan, Director, GIM and Mr. Nasser Munjee, Chairman, GIM along with other members of the Board of Governors, students and faculty members of the institute were present. The 17th Convocation ceremony at GIM began with the Director’s Report on the institute’s performance for the last academic year, highlighting the achievements of the B-school and its students. The students of GIM proved that they are the products of one of the best in B-schools across the country with placement offers from some of the top companies in India which included Goldman Sachs, Citibank, Deloitte, D.E. Shaw, HUL, Infosys, Cognizant, PWC, E&Y, KPMG, WIPRO, Tech Mahindra and Amazon. IT, Consulting and FMCG companies among others. Most of the students have received lucrative placement offers. The Shri Damodar Sripad Borkar Gold medal for Best Academic Performance PGDM was handed to Aniket Vallabh Kuncolienkar while Shaunik Seth received the Prof. Tarun Pasricha Silver Medal for Academic Performance. The Fr. Romuald D’Souza Gold Medal for Best Student of the Year PGDM was awarded to Jose Clinton Richard Braganza. GIM Gold Medal for Best Academic Performance Part Time PGDM was awarded to Dipti Deepak Chaphekar and the GIM Silver Medal for Best Academic Performance Part Time PGDM was awarded to Sayju Karim Andani. GIM Gold Medal for Best Academic Performance PGDM – HCM was awarded to Geetanjali Saha and the GIM Gold Medal for Best Student of the Year PGDM – HCM was awarded to Kamat Ghanekar Narayan A/S Bhagyesh Dilip. The other awards that were handed over were the Shri Nirmal Goswami Gold Medal for Communications of 2016-17 to ¬¬¬¬¬¬¬Nikhil Sunil Dhaygude while Jubin Abraham Mathews received the Alumni Association Gold Medal for the Best Summer Project 2016-17 and Dr. Deepa Martins Memorial Medal for Special Recognition of Extra- Curricular Activities (Silver Medal) to Bhanu Nangru. Over the years Goa Institute of Management has earned the enviable reputation of being one of the finest management schools in the country. B-school ranking surveys have shown a rising trend in ranking for GIM with the prestigious B-school consistently ranked among the top 25 B-Schools in the country and among the top ten private B-Schools in India. GIM’s strength is its diversity, be it in its academic, ethnic or social diversity. The institute presently boasts of outstanding students, excellent infrastructure and the best talent that make up its core faculty.